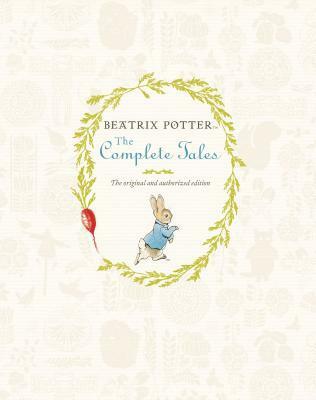 This complete and unabridged collection contains all of Beatrix Potter’s Tales in one deluxe volume with all their original illustrations. The stories are arranged in the order in which they were first published so they may be read in their proper sequence. Of course the most well-known tale by Beatrix Potter is of Peter Rabbit, but that isn’t my favourite by far. I adore The Tailor of Glouster, and I have a soft spot for The Tale of Jemima Puddleduck. I was surprised that these tales aren’t as short as I remembered. Some of course are longer than others, but there is a decent story being told with intricate plots and characters, conflicts and drama of all kinds. In this complete collection there were stories I knew, there were also characters I knew but whose stories I had never read. Then there were others that I had never heard of, like The Tale of Mrs Tittlemouse which was a delightful tale of the small mouse who was incredibly houseproud who must fight off intruders, and deal with the mess people kept making. I loved her little house with the larder and pantry, this underground world mimicking the human one. There are many stories to love in this collection and I think perhaps the only one I wasn’t quite fond of was The Tale of Piggling Bland. It is one of her later ones and is certainly quite strange, though not overly complicated on the surface. I never could understand this story, even as a kid. The pigs being sent to market in hope of being bought by humans, but not for food but for labour, possibly? It’s all a bit strange and not one of her better ones in my opinion. One things I did love was how Potter ages the characters. They are not the same forever, stuck in their youth and misgivings. Peter and Benjamin grow up, have families of their own and become responsible. I also love how the characters are connected to one another. Jemima Puddleduck is known to Tom Kitten and so forth. It creates a wonderful universe where there are also humans who interact with them, but they have their own society as well, with proper etiquette and propriety included. A smaller version of the human world. Some tales have the animals interacting with humans, others don’t seem to have any connection at all. The little world where they shop and have their own homes, where there are others like them is a great society. The theme across all the stories is that the animals are their natural selves but also have human tendencies. They dress in clothes, but eat their typical food and have natural enemies. All a bit bizarre when you can talk to one another over sugar but at the same time have a neighbour eat another. Nadia May does a brilliant job with the narration. Her gentle tone suited the stories remarkably well and because of how Potter has written the tales, it supports the idea that she is telling you the story herself. I loved delving back into the world of these animals and their stories. Potter’s tales are a wonderful mixture of mischief, cautionary tales, and general life for these animals. Foxes lust after eggs, rats and mice infest houses, fish eat toads, but with bonnets and petticoats to manoeuvre there is also a delightful society of creatures, personified but not so much as it stops them being animals. When Missis and Pongo’s puppies go missing, the two Dalmatian parents know the scary Cruella de Vil has had something to do with it. After all, she adores furs, and the Dalmatians have such beautiful coats… The dogs’ pets, Mr and Mrs Dearly, don’t understand them, so it is up to Pongo and Missis to rescue their pups. I found this book when I was in the midst of tracking down books of movies I love and this was one of them. A book I didn’t know existed but am glad to have found. 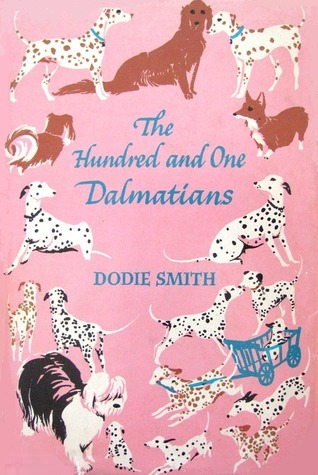 The story of The Hundred and One Dalmatians is charming and sweet and looks at the world through the eyes of a dog. Not in depth, but these animals still see the world very human like, less as a dog alone and more dog in a human world. For those who think they know this story will be surprised at the differences, but some similarities stay the same to the movie versions. It is a bit odd reading it with preconceptions but you soon forget and embrace the story as its own. As characters the dogs are not that bad. Pongo is a strong dog who loves his ‘pet’ and his ‘wife’. Pongo’s wife Missis is a bit daft and a little stupid if anything but she is sweet. I had liked the idea of two strong dogs fighting for their puppies but Missis is too stupid sometimes though for a dog it is understandable, but the way other dogs are portrayed she stands out, though some of the explanations about Pongo and his behaviour as just as farfetched. There is a third dog added into the story, I didn’t care for her very much for the most part but by the end she is tolerable and every one has their place. I did like how close to reality some of this remained. Smith looks at the logistics of traipsing all those dogs across England and knows that for them it isn’t going to be a quick trip. She includes potential dangers and how dogs can be limited no matter how much they ‘learn’. I am not entirely sure when this was set, but based on its first edition and some references it was before a lot of suburbia took over England and a lot of modern conveniences took over. This makes it very adventurous but being from that era it is adds realism. A lot of dogs feature in this and each have their own helpful natures that are very dog like. But they are subject to judgement as it certainly doesn’t add to the Staffy’s reputation, but aside from that a lot of these breeds are true to nature even if a smidge exaggerated. Smith plays with the reader a bit but in the end it is rewarded and makes a good memory test trying to keep track of everyone but she did well. A decent read and a new experience for someone who likes this story, especially if you are ingrained in the movie versions as I was. Long Lost Reviews is a monthly meme created by Ally over at Ally’s Appraisals which is posted on the second Thursday of every month. The aim is to start tackling your review backlog. Whether it’s an in-depth analysis of how it affected your life, one sentence stating that you only remember the ending, or that you have no recollection of reading the book at all. Euripides was one of the most popular and controversial of all the Greek tragedians, and his plays are marked by an independence of thought, ingenious dramatic devices, and a subtle variety of register and mood. Medea, is a story of betrayal and vengeance. It is an excellent example of the prominence and complexity that Euripides gave to female characters. As I was looking for a review for this month I realised I had a few written that I never shared outside of Goodreads. I found this one from 2008 when I read Medea and thought it suited the LLR perfectly because it was an actual lost review. Euripides tells the story of Medea who uses her anger and feeling of personal betrayal as a means to seek vengeance on the husband she thinks has wronged her. Reading this play was rather different. It was strange, amazing and a little bit horrible. 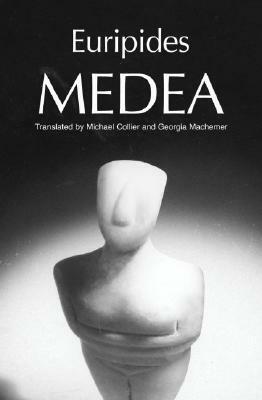 Medea connects to other ancient Greek Myths and this is one of the stories that follows Jason and the Argonauts. After Jason leaves Medea for another, Medea justifies her actions by blaming Jason for leaving after all she had done to help him in the past. There are some pretty strong themes in this story, there are various forms of violence and Euripides does describe them well despite their nature. being a play a few things are left off stage and no seen but the meaning is clear and the results are obvious. You get to understand where Medea is coming from the way Euripides presents her. She has monologues and discussions with various people, but you can also see how irrational and ridiculous she is being as well. As I say, it isn’t the most pleasant story, but it is interesting and amazing at what this woman does. The lengths she will go to and the destruction she intentionally causes with justifications for every step simply for revenge is astonishing. A delightful and original work in the midst of the ongoing debate of print versus digital through humorous and silly questions from an IT-savvy donkey and a book lover monkey’s simple answers, the monkey sees the value of a printed book. Playful and lighthearted with a subversive twist that is signature Lane Smith, It’s a Book is a delightful manifesto on behalf of print in the digital age. This satisfying, perfectly executed picture book has something to say to readers of all stripes and all ages. While I’m not always the biggest fan of talking to kids and young people about books like they’ve never seen one in their life, this is a cute little book for kids that simply tells them what a book is. With Mouse and Monkey’s help, Jackass – yes, that’s his name – learns what a book is. It’s actually quite clever at the end with something for the adult mind to enjoy. Smith’s illustrations are unique in design, I loved the size difference between Monkey and Jackass. The colour tones are subdued but not bland, and the lack of complicate backgrounds leaves you to focus on the pair sitting in their chairs. 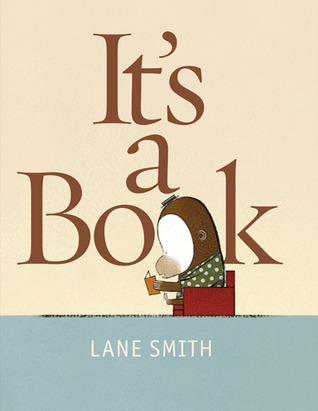 There are few words and it’s a dialogue type of story, but even with so few words Smith manages to tell a great story about the magic of a book and how it differs from technology. This could be a good book if you have got a kid who is learning to read and discovering books for themselves or is used to only using digital mediums, either way it was clever. Bear does not want to go to the library. He is quite sure he already has all the books he will ever need. Yet the relentlessly cheery Mouse, small and grey and bright-eyed, thinks different. When Bear reluctantly agrees to go with his friend to the big library, neither rocket ships nor wooden canoes are enough for Bear’s picky tastes. How will Mouse ever find the perfect book for Bear? “The librarian smiled, but a mother squirrel squished an angry finger against her lips, and an old raccoon said sternly, ‘Quiet in the library.’” Oh that sounds familiar. It’s never the librarian shushing anyone. I love this book, Becker’s narrative is hilarious and I love Bear’s logic that he doesn’t need any more books because he has seven already. It’s not a nonsense book, but it is a bit silly in a serious way. Bear’s obstinate and Mouse is patient and despite Bear’s grumblings he goes along with Mouse to the library because he had agreed to go. 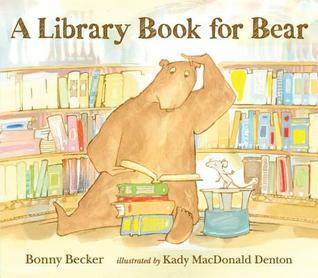 A great case of ‘don’t knock it till you try it’, Bear’s experience of the library is wonderful, and showcases all the wonderful books a library has to offer. Denton’s illustrations are beautiful accompaniments. She puts a lot of expression into Bear and Mouse, capturing the stubbornness and exasperation. I love the small details like Bear’s roller skates and his grumpy expressions, even when the wind is blowing majestically through his fur. There is a great use of text and formatting to help tell the story, with different size fonts to convey tone and style. The story is simple with short amounts of words on each page, Denton’s illustrations taking up most of the page, but Becker’s story still says a lot and tells a full story that is engaging, enlightening, and entertaining.